That something is cooking that much is certain. What, why and how it will unfold, time will tell. 1) The recent political re-kindling over the future of Syria between Russia, Iran and Turkey. 2) Recent developments in Venezuela. A) If that map has any credibility, EU is non committal, and for good reason IMO. Who wants a WW between trading partners? Just an interesting development that got lost over the notepad Bolton was holding with the notes " Welcome Afghan talks; 5k troops Colombia". However, that map IMO stores more implications regarding the back scenes of international politics. It was an good idea to start this thread dedicated to the current geo-political events in the world Archetype0ne, well done. Now the Council's letters seem to imply (words quoted) that the King will keep no strangers save the Albanoys. Cales, 17 Dec. 1545. Signed. As long as I ignore trolo provocateurs since post 1 in this one, I should not have hypertension xD. Edit for clarity: Not meant @ Labëria, but referencing an inside story from a previous thread. "Russia's Lavrov says U.S. sanctions on Venezuela oil company illegal"
"MOSCOW (Reuters) - U.S. sanctions imposed on Venezuela’s state oil company are illegal and Russia will take all necessary steps to support the administration of Venezuelan President Nicolas Maduro, Russian Foreign Minister Sergei Lavrov was quoted as saying on Tuesday. Lavrov said the sanctions amounted to an attempt by the United States to confiscate Venezuelan state assets, Russian news agencies quoted him as saying." "Venezuela's Guaido calls for new protests as pressure on Maduro rises"
"CARACAS (Reuters) - Juan Guaido, the Venezuelan opposition leader and self-proclaimed president, on Monday called for new street demonstrations as pressure intensified on President Nicolas Maduro and the crisis-stricken OPEC nation." 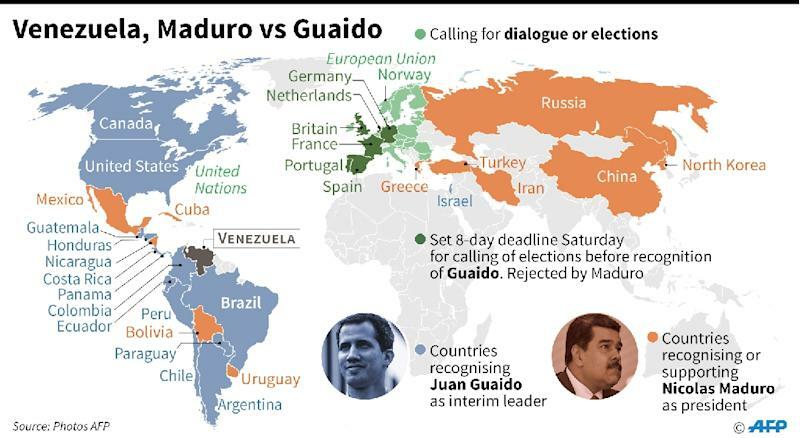 "Countries around the world have recognized Guaido as Venezuela’s rightful leader, and the United States vowed to starve Maduro’s administration of oil revenue after he was sworn in Jan. 10 for a second term that was widely dubbed illegitimate." I am providing Reuters as a source in an attempt to minimize bias. Although that is nigh impossible. The first article has the Russian Foreign Ministry as a source. As to the second my guess would be Guaido's camp. As for my take on above two articles. It seems evident the question Mnuchin declined to answer yesterday regarding an Embargo is de facto a reality. Albeit newspeak renders it to sanctions. I would like to stress that although Geo-Politics can not be debated bias-free, we can still strive toward such a debate. For what does not get resolved with reason, gets resolved one way or the other. Last edited by Archetype0ne; 29-01-19 at 15:02. I have got to say, I support EU's decision for a peaceful solution to this. But as we have seen earlier this decade not everything can be resolved through elections. As an example Palestinian - Israeli relations were getting better, that is until Hamas won the democratic elections. Then the rhetoric changed to one of "embargo Gaza". So despite democracy being a just measure of peoples wills, international relations seldom is fully compatible with democratic votes, or with self determination, sadly. On the other hand, I could only guess the Hawks in the East and in the West cant wait to get their hands on another War... And I could only guess, had the EU fully supported the US course of Action we would be in a "global" war right now. I refuse to say world war, cause in the 21st century it seems proxy wars is where its at. In this proxy wars the civilians are the real victims. It is a bit sad that me and Labëria have to keep this thread alive, when such a storm is over the future of Geo-Politics. This is beyond cold war now, this is becoming an open ended conflict. Here, I am hoping they give Maduro amnesty, to set a precedent of co-operation, and fully nationalize Venezuelas wealth for its People akin to what Norway did with their sovereign fund. The other options I dread to think about. Last edited by Archetype0ne; 31-01-19 at 18:33. If this is true, Maduro has morally lost every right to govern that country. Well at this point he needs all the help he can get. 400 Troops will not be able to do much beyond personal body guard duty if this escalates. The thing is in May of 2018 Maduro "won" the elections. There were claims of irregularities, and the opposition did boycott the elections. But still on paper, he won, so opens a big debate about moral right to govern. I personally support neither Maduro neither Guaido, I just hope Venezuelans get food to eat, and medicine to treat their sick. Pathetic how the innocent bare the brunt force of power struggles. It seems material resources are more of a curse for poor not established countries... Such a sour irony. There are also 1000s of Cubans too. They've been in Venezuela for a while. It`s not that i am taking side in this story. But it`s scandalous that he use mercenaries for his personal protection. There is not one Venezuelan man ready to protect his President? It`s a shame. Now, this should help Trump supporters to understand how big of a moron Trump is. I've seen similar situations way back in Eastern Europe. Thanks to good man Gorbachev, he abolished communist dictatorships, and most of us had a happy ending. Unfortunately there is Putin now in power, who supports all dictators, like Maduro, around the planet. His support also includes wanna be dictators like Trump. Nobody saw Trump as an ideal candidate, far from it, but he at least came across as sincere in what he said he wanted to do (regardless of whether folk expected him to achieve his aims when confronted by the deep state, mass media and left-wing autism). Given the choice between an honest buffoon and a cold, calculating, lying, morally-reprehensible, openly-warmongering career politician like Hillary Clinton I know which I would opt for. Cuba would give Maduro a safe haven, and Russia would replace Maduro by a puppet for Putin. Russia wants to protect its oil interests and have a military base in Venezuela. Your name-calling won’t change anybody’s mind. As a matter of fact, your approach Backfire Spectacularly, always. 1. Trump told his Intel Chiefs to "go back to school" in yesterdays meeting. 2. Since January 1 he has had an average of 1 scheduled task a day. This means yesterdays meeting, was the only meeting in his Schedule. We are talking about The President of the United States here. It appears to me there might be some legal battle going in Washington behind the scenes. Since Democrats got the House, The President might be in some sort of "executive oversight", or colloquially speaking "timed out". Do you guys not think The President of the United States would have more than one meeting/thing on his schedule a day? This is what makes me think things are much worse than anyone anticipates. The best thing that could happen to Venezuela and to its neighbors, like us in Brazil, is that the regime gets weakened and discredited enough so that part of the military withdraw its support - still clinging strongly to Maduro government, which since Chávez (a military himself) favored the Armed Forces a lot (and again proving that it's never a good sign when the military get too involved in politics - we in Brazil should've learned that back in the 60s, but apparently we didn't, as they're starting to making a comeback, but now in a more "civil" approach). I don't think anything concrete and good will come out of a situation in which the country would have two self-declared legitimate government vying for power within the same territory and backed up by different international (and bellicose) powers, especially considering that Venezuela is now one of the most violent countries in the world and extremely stressed out, with increasingly violent politics. Especially if they hear the Americans and Russians a bit too much - as that "casual note" demonstrates - it's very likely that the current problematic situation will degenerate into a full-blooded civil war, a Latin American Syria. And Venezuelans do no deserve nor need that, and the problem of Venezuelan exodus is already too big and difficult to handle to be made even worse by a civil war. Negotiations after bringing the regime to its knees, and instilling unsatisfied parts of the Armed Forces to be bold enough to express their discontent, would be the best strategy. Usually rational actors do not contradict themselves. Any such rational actor acts at the function of a certain goal... Based on strategy etc. You can not have the same actor, without "multiple personality disorder" change their policies on the whim to their own interests detriment. Now you have Bolton(5k Troops, Welcome Afghan Talks) implying "capitulation"(do not flame me for my personal opinion) in Afganistan and Syria. The strategy/system of action is the same. If what I am saying makes any sense. It's just in your head, because facts are pointing to other direction, Trump being the one. 6 Trump's associates from pre election are in prison now, and more under investigation. Also there are not less than 17 open investigations against Trump himself. Not ideal candidate? The idiot "deal maker" with super senate can't get even a deal for his fence. I don't have time to mention his speech, logic, ethics, empathy, social, financial, business, and other impediments. Exact point how Trump is out of his depth and width and intellectual stamina of being a president, among countless other shortcomings. Not understanding well geopolitics doesn't help him either, nor it helps western world and our allies. “The Force” of fake news is Strong. It's a well-known fact that members of the Cabinet tend to dramatize to a degree. In case something goes wrong, to get more money for their Department, and to ensure the relevancy and importance of their Job. None of the allegations of the Special Counsel is strictly against Trump. The vast majority of indictment against the President's associates date-back to the time of Neanderthal roaming the Earth. Edit for the lul: Did they even have touch-screen in the first Start Wars franchise? But I can't fail to notice how almost everything in that list has been in development probably since before Star Wars was even a thing xD. Lastly, even the most bewildering imo, the Artificial Moon one has been speculated by the Chinese, along with quantum technology... Imagine having a "military satellite" and some malicious actor hacks it. Not that I am paranoid for life xD, the material world barely sustains me, let alone entertaining me. Now... If we can use Neural networks to beat the absolute best e-sport athletes and pilots...(Alphago,Alphazero, The above Starcraft example) This AI is not dependent like humans on reaction time... can learn thousands of years over the course of a week of sparring with itself. Feels nice to develop it I bet... especially when you think it will be used against hostile actors. What I am really worried about is how much control "we" really have over the weapons we are developing. By we, I don't mean east or west, I mean the whole of us. Edit:About the military satellite... Considering US left the treaty regarding Intercontinental Ballistic Missiles... According to both U.S and Russian mouthpieces, the signal is pretty clear, there is an arms race going on. Conspiracy Theories are not generally public knowledge on the other hand. Last edited by Archetype0ne; 01-02-19 at 01:04. OMG. If it's not racists or ultra-nationalist Balkanists, it's conspiracy theorists.